Early Praise for The Perfect Edge and Our “Blade Bucks” Offer Lives On! I’m not one to toot my own horn — honest. But I can’t help but share some of the kind things readers are saying about my book, The Perfect Edge. If you haven’t purchased your own copy yet, I’ve decided to extend the Blade Bucks offer indefinitely. Order your copy of The Perfect Edge from HOCK TOOLS and we’ll include a Blade Bucks certificate good for $10 off your next purchase from Hock Tools. “Aye, mate, ’twas worth the wait. I haven’t had much time to myself until today, but on Christmas Day, amid all the extended family commotion, I was finding some peace in my leather recliner reading the first few chapters of your latest work. Well done. It’s been 38 years since I was in Materials Science class, a course I enjoyed and did well in, and your section on metallurgy should be adopted as a supplement for those courses. Much better written than any textbook I’ve ever had to wade through. It is a credit to you on how you’ve written this that I find it draws the reader in and I just keep reading along. I particularly commend you on your choice of advisers … an impressive list of experts lending their assistance, further improving the books credibility for me. I have much more to read, but this effort looks to be worth every bit of the energy you put into it — and having an autographed copy may well prove at some point to significantly enhance the perceived value on the bookshelf.” — C.D. “Received the sharpening book today. First pass through – very satisfied – exactly what I bought it for: great information on sharpening, steel, and machines for sharpening. Glad you chose to write this book!” — B.P. “I just received your book. I am not a non-fiction lover preferring murder mysteries. But, as a woodworker also, I have been fascinated and have learned as much about sharpening in a few hours of reading, as I accumulated over the past years. Thank-you for your efforts.” — G.T. “Wow! I must say that you have done a masterful job of tying together an enormous amount of technical data. Your sense of humor comes through as well without distracting from the flow. The book is also a visual treat- clear large images leave no doubt as to what you mean to illustrate. There is plenty of hard data to keep the controversies going. I think you have given a very balanced view of the great variety of methods available. In my opinion you have the absolute top book on the topic-period. Congratulations.” — B.B. I am humbled by your kind words and thank you all so much. Author Ron HockPosted on January 5, 2010 January 5, 2010 2 Comments on Early Praise for The Perfect Edge and Our “Blade Bucks” Offer Lives On! Bevel-up (BU) planes have been getting a lot of buzz lately – not undeservedly; they’re great planes. Part of their popularity comes from the ease with which the user can adjust the angle of attack – the angle at which the edge enters the wood – for planing various woods in different planing circumstances. To adjust the angle of attack, i.e. steeper for difficult grains, you simple hone a steeper microbevel on your blade. Reducing the angle will take a bit more time as the whole bevel must be re-ground to the lower angle. A small price to pay for such versatility. You can easily achieve the same goal in your standard Stanley-style bevel-down (BD) plane by back-beveling the blade. What’s back-beveling, you ask? It’s simply adding a small bevel on the otherwise flat back of your plane iron. 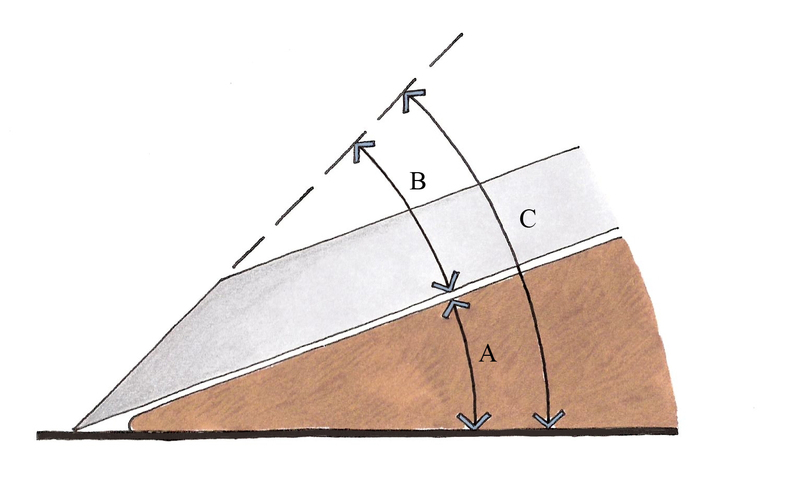 Most BD planes bed the blade at 45° – the angle of attack. This is a good angle for most work. With difficult grain,that’s prone to tearing out, however, you may benefit from a higher angle of attack, say, 55° or even higher. With higher angles of attack, the fibers are less likely to be levered up by the blade to tear out of the surface you’re planing. You do have to push harder, but you can achieve a smooth surface where you may not have been able to with the lower angle. The amount of back-bevel can be quite small; the wood only sees the first few molecules of the edge so a back-bevel as small as 1/64” should suffice. 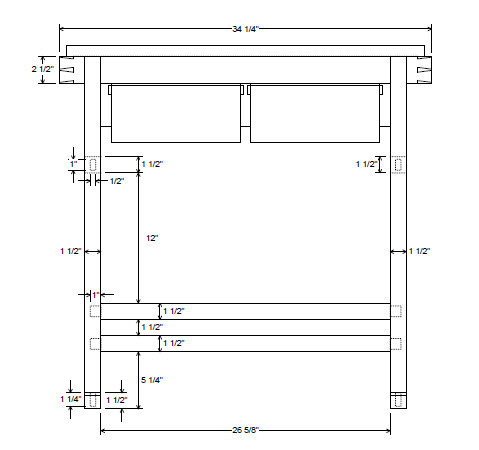 And there is no need to flatten the rest of the back – a real plus. The only down side to the back-bevel is that, if you wish to revert to a lower angle of attack, you’ll have to grind the primary bevel back past the back-bevel and start over. That’s not different, if you think about it, from the blade bevel in the bevel-up planes, where you have to shorten the blade to increase the bevel angle. 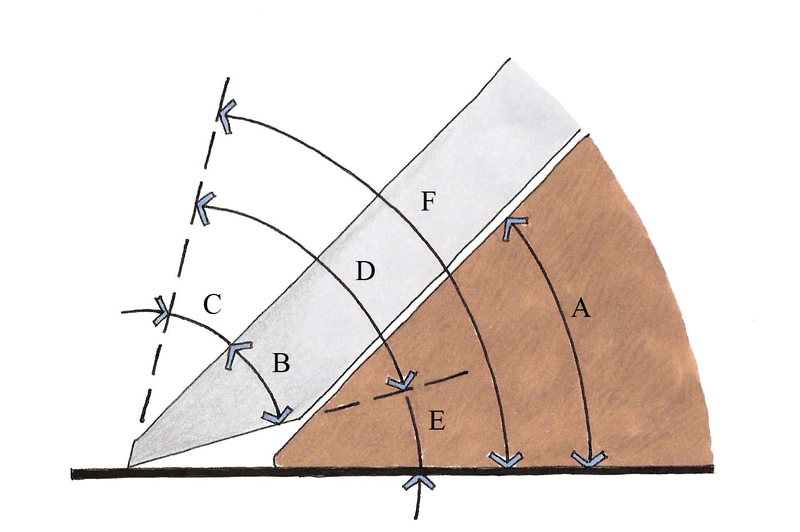 With a bevel-down blade, you have to shorten the blade to decrease the angle. My friend, Brian Burns, guitar- and tool-maker, wrote a 32 page booklet about back-bevel sharpening, Double Bevel Sharpening. He’s condensed years of experimentation into an interesting tome complete with clear illustrations that even includes instructions for building his ideal honing system. Brian says that a blade’s angle of attack should be adjusted for different woods the same way a metal-cutting tool is ground at different angles for different metals. Once you have a repeatable method for dialing in the back-bevel it only takes a few extra strokes at the sharpening station to avoid tearout in difficult woods. The illustrations above are by Martha Garstang Hill, who created the beautiful hand-drawn illustrations for The Perfect Edge. Thanks, Martha. We’re feverishly shipping out the pre-ordered books. A whole bunch left here yesterday (the weekend’s packaging efforts) and more will go today and tomorrow and next week as needed. We appreciate your patience and sincerely hope you get what you want from the book. Konrad Sauer called me the other day with a sharpening question that I couldn’t answer. I hate that. Not the call, but the drawn blank with which I responded to his question. The issue is esoteric but that just makes it more interesting (to me, anyway). Konrad sharpens his blades using a Shapton 15,000-grit stone for the final polish. He says he notices an improvement in the wood surface quality and edge retention when he goes the extra mile (or fraction of a micron, if you will.) He recently tried a natural waterstone that he believes to be about 20,000-grit (natural abrasives can be rather vague in this regard). The surfaces left by the two stones look very different and with that, as Holmes said, the game’s afoot. Here’s Konrad’s mystery: why is the surface left by the natural stone a uniform matte while the Shapton 15K leaves a polished near-mirror? I was stumped. I’ve noticed something similar when I used wet-or-dry sandpaper for honing but never thought much of it. Now I was on the spot. The sharpening “expert” stumped by one of his customers. I couldn’t come up with any decent reason for this at all so I emailed another expert, Harrelson Stanley of GetSharper.com, the Shapton importer in the USA. Harrelson’s first point is that “the very best natural waterstones top out at about 10,000 to 12,000 grit” so Konrad’s final polish with his natural stone may not be contributing to his goal in this case. But I know that “near-mirror” starts at much coarser grits so this doesn’t answer the matte question. 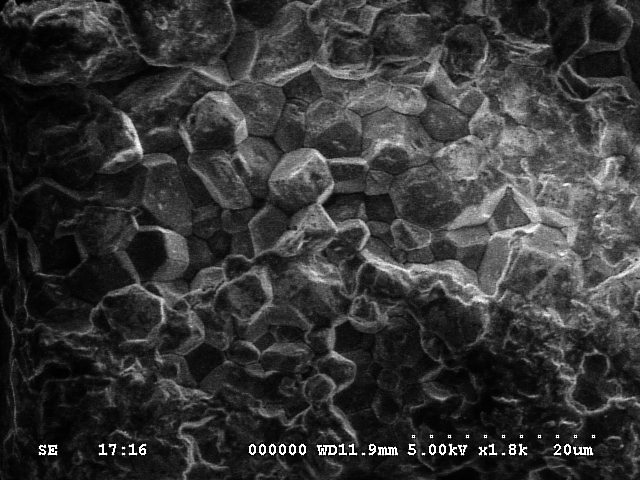 Harrelson next suggested: “the hardness of these particles is about 6 on the abrasive hardness scale; ceramic is 9 and diamonds are 10. The particles in the natural stone are very round … and do not leave sharply defined geometric walls to the grooves they cut. Therefore they do not refract light very well. The very fine ceramic stones leave extremely fine grooves … with very angular walls that refract light well.” Hence the matte surface. He also gave me a contact: Gary Runyon is a geologist with metallurgical training. I sent him my questions, then he and I had a great conversation that propelled the investigation forward. 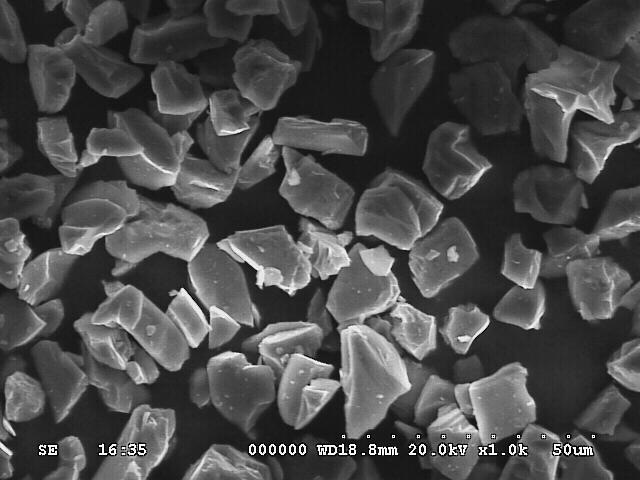 Gary told me that the abrasive particles in natural waterstones, being softer and rounder than the grit grains in manufactured stones, have trouble abrading the various carbides in tool steel. The iron matrix is not quite as hard as the carbides it contains so the grains wear it away faster, leaving the carbides as slightly proud, rounded domes. The matte surface is essentially a relief map of the microscopic carbides exposed during honing. The harder and sharper aluminum oxide grains in the Shapton stone cut through the carbides as well as the surrounding matrix, leveling the surface to an optical mirror. So, where to go with all this? Or… so what? Not sure, but I’ve always found interesting the way things work as they approach their limits. The notion of exposing and making visible the very grain structure of steel is intriguing to me and, I hope, to you, too. And I am intrigued when an action as seemingly simple as scratching steel with a (very small) rock yields unexpected results. I’m sending Konrad a couple of small blades to hone on the two stones and then send back. I’ll have them photographed with an electron microscope and post the results so we can see what’s going on close up. Stay tuned. Get $10 “Blade Bucks” with The Perfect Edge! 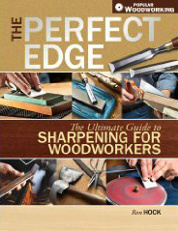 Order The Perfect Edge, the Ultimate Guide to Sharpening for Woodworkers from HOCKTOOLS.COM and we’ll include with your book a $10 “Blade Bucks” certificate good for your next purchase from HOCK TOOLS. The Perfect Edge is due to arrive late this month. We’ll ship as soon as we have them in stock. I’ve included a lengthy chapter on tool steel metallurgy, heat treatment, even rust, as well as a chapter on abrasives: what they are and which one does what best, along with how-to chapters on how to sharpen your favorite tools. Tell your friends! Really, please tell your friends! Author Ron HockPosted on December 1, 2009 March 27, 2013 5 Comments on Get $10 “Blade Bucks” with The Perfect Edge! This bench would make valuable addition to any shop. Sharp tools are essential to quality (and safe!) work. If it’s a pain in the neck to find and set up the sharpening gear, your tools may not receive the attention they (and you) deserve. A dedicated station like this is more than a luxury, it belongs in the shop as much as any other work station. Very nice work, Tom. We’ll look forward to your next post. Thanks! Thanks for sharing your tale of woe, Al. It’s a valuable lesson. I hope you don’t mind that I’ve hijacked your post.